Pity poor Lady Mary Portman. The beautiful, young English aristocrat was a talented violinist – studying in Leipzig in the early 20th century – and friends with the most prominent German musicians and artists of the day. In 1913, after visiting the picturesque Kranzbach Meadow in the Elmau Valley, she bought the land and set about building a stunning home in this idyllic Alpine setting. But history had other ideas. Just as “The English Castle” (as it became known to the locals) was nearing completion, WW1 broke out and Lady Portman was forced to return to Britain, never to see her beloved creation again. But she left a legacy – the only English country house in Germany, Das Kranzbach. Mary may struggle to recognise her would-be dream home 100 years later. 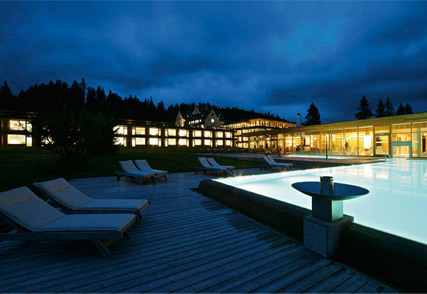 After stints as an artists’ retreat, a movie set, athletes’ dormitory and a convalescent home, Das Kranzbach is now one of Germany’s premier spa break locations. The original house still stands and was recently refurbished by another stylish Brit, Ilsa Crawford, of Studio Ilsa fame. The place has a fun, retro art deco feel, with sleek chairs and oversized lamps in gaudy colours. You can sup tea in the afternoon or something stronger in the evening in front of roaring log fires, perched on huge, colourful chaise longes or sofas or play chess and backgammon in the games room. It’s lively and bustling during our stay, particularly in the evenings and feels like an imagining – barring the odd anachronistic iPhone – of how Das Kranzbach may have been in the roaring 20s, had Lady Portman had a chance to entertain the great and the good there as planned. 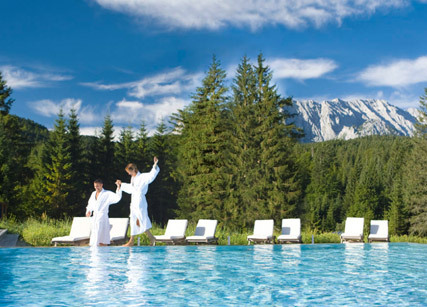 Next to the historic house now lies a large spa and hotel complex constructed in modern wood and glass but blending into the natural, mountainous surrounding effortlessly. The building houses numerous steam rooms, saunas, in and outdoor swimming pools, hot tubs, treatment rooms, sports facilities (more of which later) and an exceptional restaurant – the buffet breakfast was a particular highlight where we sampled everything from healthy drinks from the bespoke juice bar to hearty German sausage and cheeses, all while watching the brilliant morning sunshine rise over the mountains. You won’t go hungry here. The aforementioned breakfast will set you up for even the most strenuous activity (we opted for a short trek up a nearby peak). But there are a range of activities including mountain biking, Nordic walking, yoga, pilates and even skiing during the season at the nearby town of Garmish Parten Kirchen. A light lunch consisting of soups, saurkrauts, bread (freshly baked everyday on the premises) and veggies is served from midday to 2pm, followed by a five course dinner in the evening. There’s even a special low fat low carb menu for those going for a full health hog. While a variety of elegant rooms in varying shapes and sizes are available in the original building – decorated in similar the glam retro stylings – our room is part of the new annexe and is decorated beautifully in a full on modern Alpine mode. There are wood panels on all of the walls and solid wooden flooring, with a spacious en suite bathroom behind a large glass partition. On the opposite end of the room are huge patio doors that open onto a small terrace and a view over outdoor pools (steam rising from them in the cold winter air) and the mountains in the background. I feel like Heidi. The spa is one of the best I’ve visited. There are the aforementioned indoor/outdoor pools (you transfer between them by swimming through a Bond-like connecting passage, myriad relaxation areas (the hotel manager Klaus takes pleasure in telling us the New York Times described the place as being the only place they’d stayed where there were more loungers than guests) and state of the art treatments. I went for a hot stone massage – the therapists were friendly and also very skilled. It was blissful. There is also the opportunity to detox – with an experienced nutritionist and therapist on hand to work out your intolerances and set up a personalized treatment plan. If the food wasn’t so delicious – I may have been tempted to give this a go. The highlight (or low light depending on your levels of prudishness) is the naked sauna, were you can sweat it out with your new German friends while staring out over the Bavarian forest. There is also a ladies’ only area for the less adventurous. This really is a magical place. When we visit it is late November and still warm enough to sunbathe in the bright sunlight but near freezing in the shade. It must be like a Christmas fairytale at the height of Winter and warm and welcoming in the summer. Lady Mary may never have got to live in her English Castle. But she rest assured that it is being put to excellent use. PRICES: A stay of seven nights start at 144 euros per night. Visit www.daskranzbach.de/ for special offers.